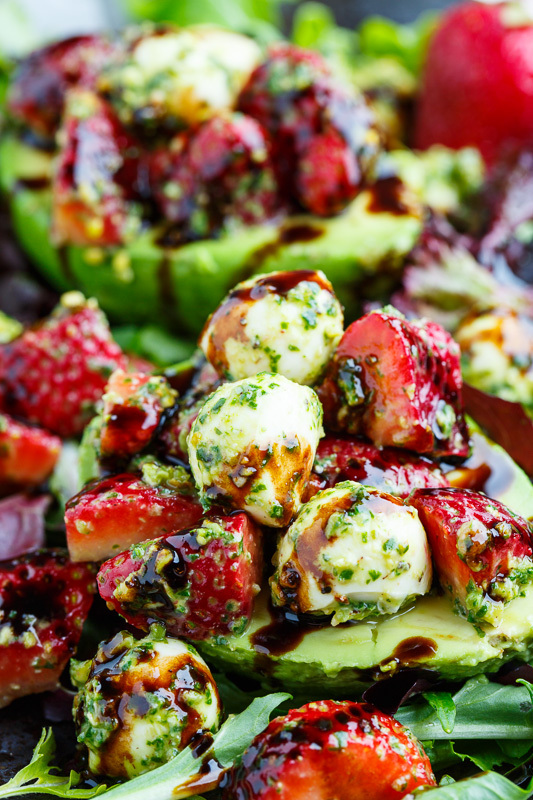 A fresh and summery strawberry caprese salad stuffed into avocados with mozzarella, balsamic reduction and a creamy pistachio pesto! Strawberries are one of my favourite summer foods, along with tomatoes, and while I am eagerly awaiting the field ripened tomatoes I thought that I would use strawberries as substitutes in my favourite tomato salad, the caprese salad. The caprese salad is a simple salad consisting on ripe tomatoes, fresh mozzarella and basil and it’s often accompanied by a splash of balsamic vinegar. 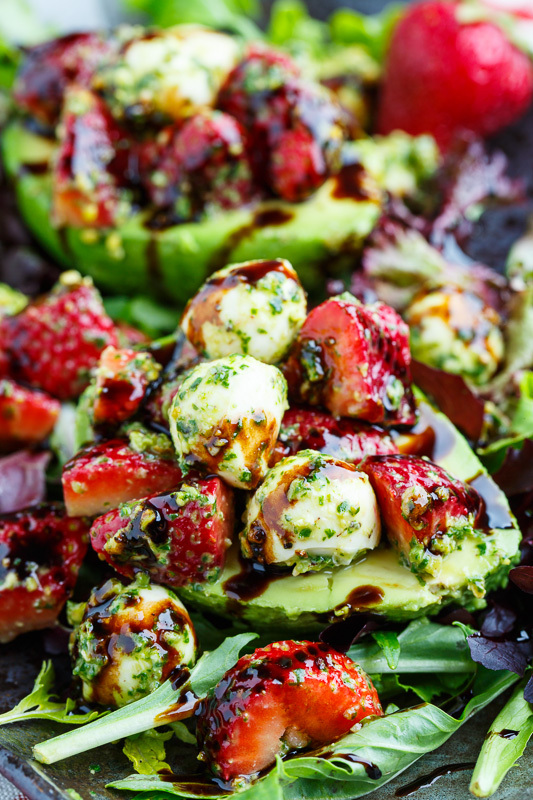 For this caprese salad I replaced the tomatoes with strawberries and the basil comes in the form of a basil pesto with creamy pistachios! Instead of just serving the salad like that I like to serve it stuffed in perfectly ripe, cool and creamy avocado halves making for one truly amazing combination of flavours that is just perfect for hot summer days! 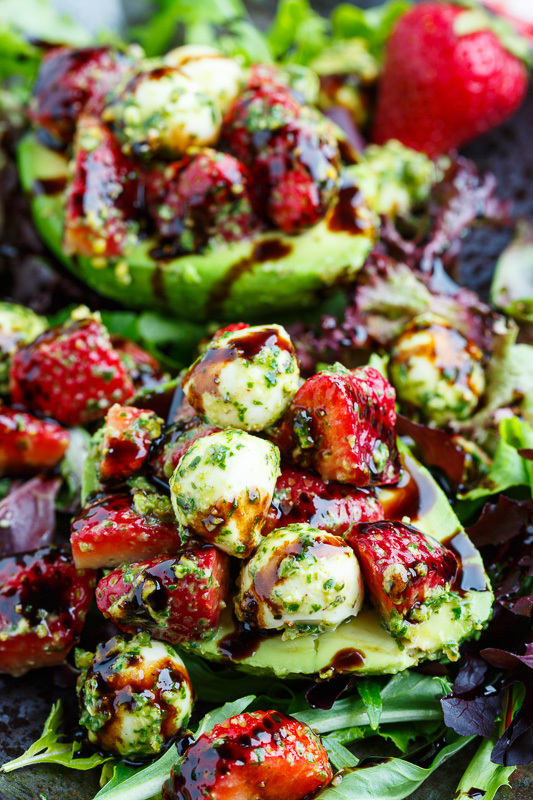 These strawberry caprese stuffed avocados with pistachio pesto and balsamic reduction are my new favourite summer treat and I’m sure that you will enjoy them just as much as I do! 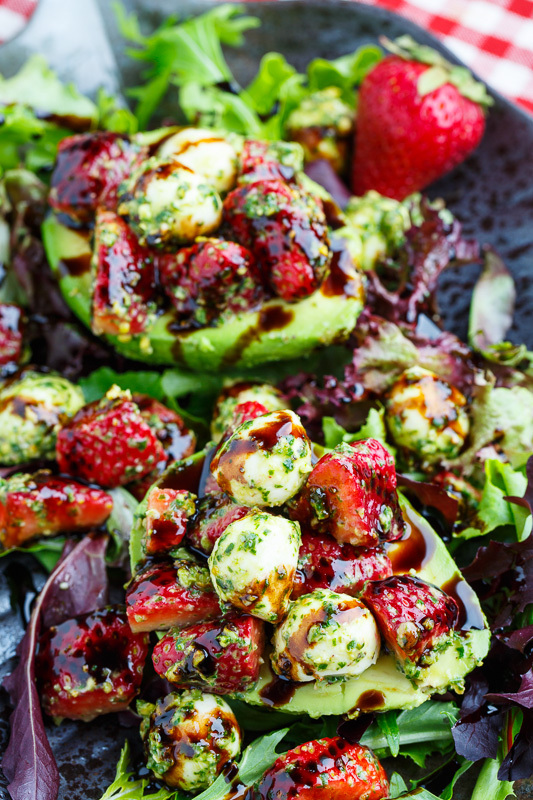 Plate the avocado on the salad greens and top with the mixture of the strawberry, mozzarella and pesto followed by a drizzle of the balsamic reduction. Note: To make the balsamic reduction, simmer balsamic vinegar until it reduces to 1/2 to 1/4 or the desired thickness and let cool before using. Omg i love that you stuffed the avocados! !